Yet more on the Nessie book Front! In a recent post, I brought to your attention three books that I hoped would be upcoming in the months ahead. In fact, there is a fourth book I can tell you about that is due for publication on the 12th November this year. It is titled "A Monstrous Commotion" written by Gareth Williams and it is a book that focuses, not on the monster, but those who have dedicated their time and energy into pursuing it. I have helped Gareth on a few points in the book (as others no doubt have), but am in no position to review it yet. What we can be sure of is that it will be of interest to both sides of the Loch Ness Monster debate. In fact, both sides can agree that that the existence of the subjects of the book has been established beyond reasonable doubt. We have the close up photos and film. We even have recordings of sounds they have made and unimpeachable testimony as to their eating habits and migratory patterns. 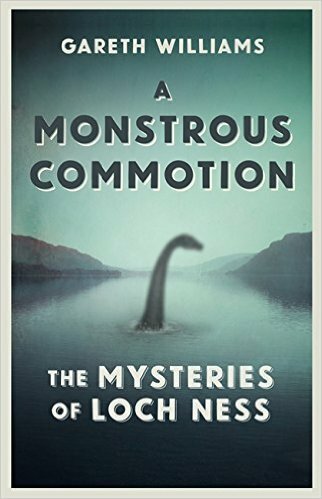 A MONSTROUS COMMOTION delves deep into the depths of the Loch Ness phenomenon, one of the iconic scientific mysteries of the last hundred years. The legend of the 'water horse' in Loch Ness and other Scottish lakes is ancient, but reports of the monster date from as recently as the 1930s, courtesy of a correspondent of the Inverness Courier. Rather than debating the arguably unfathomable realities of what lies beneath these murky Scottish waters, Professor Gareth Williams instead engages with the people who have dedicated themselves to unearthing the truth of the monster's existence. He explores just what it is that drives these people to the point of obsession, and the ways in which their own quests have changed their lives, and the lives of others. With the use of interviews and never-before-seen archives, Williams creates a gripping narrative about the diverse people and stories behind the phenomenon. In his journey to discover the allurement of Nessie, he unravels a compelling tale of human eccentricity, full of twists, turns and entertaining surprises. While A MONSTROUS COMMOTION provides the facts and history behind the legend, and lucidly articulates the current state of scientific research and evidence, readers must ultimately decide on the truth for themselves. They too will embark on a journey of discovery, engrossed by a mystery that never fails to astonish. As a footnote, books that examine the hunters rather than the hunted are thin on the ground. Of the sixty-plus books on Loch Ness that I am aware of, perhaps six focus on a person or persons involved in the Nessie hunt. Of course, other books will be semi-biographical as the author recounts their own adventures within the context of the Loch Ness Monster phenomenon (e.g. Dinsdale and Holiday). So it seems a niche is being filled here as I am not aware of any book that takes on the whole genre of monster hunter to the extent of Gareth's 400 page work. I look forward to his book with anticipation. I headed up to Loch Ness for a few days earlier this month armed with equipment and a modicum of hope. The weather was better than the last time we pitched our tent in May, but to tell you the truth, the Summer has generally been wet and a disappointment. Whether this impinges on your typical monster hunter is a moot question. Following in the footsteps of the likes of Dinsdale, Holiday and others, one might think this is not meant to be a vacation but more like an expedition. Well, it probably can't be classified as either as I also put theories about Nessie preferring calm, warm weather to the back of my mind. I pulled up at the Foyers campsite looking across to the nearby circle of houses where Tim Dinsdale had furiously driven round from the main road in the hope of catching more conclusive footage of his monster. It wasn't there as he scanned the waters and so began a debate that still echoes to this day. By way of contrast, just below the camping fields is a shingle beach where various boats are moored and ready for launching into the deep. The contrast lies in the counter theory that this was where Dinsdale's "monster" launched out with its human crew. I learnt you can now hire engine boats from the campsite in an attempt to get up close and personal with the Loch Ness Monster. Perhaps I'll bite and go out in one some day, but it is not stories of boats being hit by Nessie that deters me; more being confident that I am competent enough not to shipwreck them! As I scanned the area, the monster history of the location began to settle upon me again. Dinsdale we have mentioned, a short walk away was the site of the first ever Nessie photograph taken by Hugh Gray. Or was that a double exposure of a swimming dog over a dead swan holding a stick in its mouth? I get a bit vague on that. A glance over to the right and beyond the trees was the inlet where Ted Holiday had his first sight in 1962 of the Orm as he called it. And near to that inlet was the location where the infamous Frank Searle camped and began his less than scientific approach to monster hunting. They are all dead now, and being surrounded by such a cloud of witnesses, the importance of continuing the hunt and vindicating the likes of Dinsdale and Holiday is an ever present motivation. However, the pursuit of finding a beast that rarely surfaces was also felt. Between them, Dinsdale and Holiday saw the creature perhaps six times in their decades of visits. Whether I would be allowed to join those ranks was something very much out of my hands. Going out along the aforementioned beach, the loch was in its usual unyielding mood with dark, impenetrable waters giving nothing away. Driftwood was scattered along the shoreline and one piece of wood reminded me of the old tales of the Water Bull of Loch Ness. 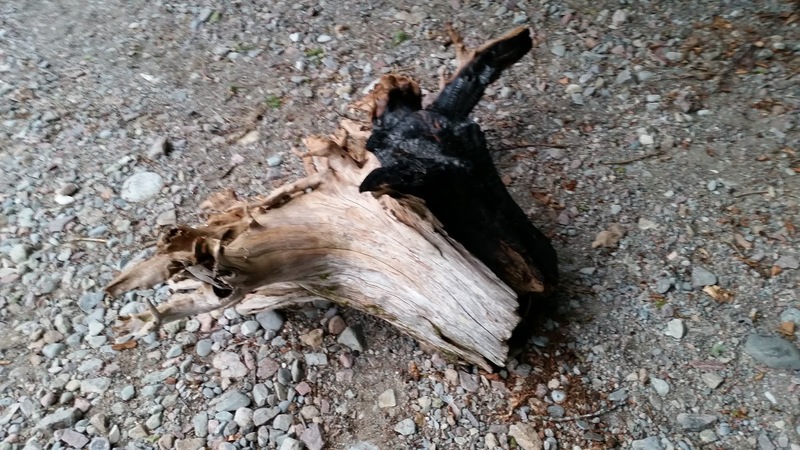 Simulacra saw to it that this piece of wood resembled a bull's head. At the first loch watch the next day, my eyes fixed upon the choppy waters. Most people do not give quality eye time to the loch. They glance at it, get distracted by kids, conversations, texting, calls, hills and passing cars. Whether people are in more of a hurry these days is a debatable issue. If less people do believe in a monster, one could assume they look at the loch in a less intense manner. So the boat wakes were scrutinised and the floating birds bobbed by. As I watched these rather insipid waves and distant beaked dots, that same realisation came upon me as it does every visit. I am less convinced of the force of these explanations of monster sightings. They look singularly unspectacular and one would barely give them a second glance, yet people tell other people that is their monsters. I will continue to accept such a theory forms part of the monster mosaic, but the role it plays diminishes for me with each visit. I say that despite a visit to Fort Augustus Pier that reproduced a "Nessie" moment from the media back in 2013. I am referring to the David Elder video that received some attention from leading newspapers. As the Royal Scot cruise boat headed up the loch, its bow wave began to spread out and move towards the north shore. I recorded the event on the video and photos below and it is clear that the boat is the source as it is still in view. The main difference between my boat images and David's is that his shows only one wave as shown below. Bow waves always appear in a train, so that was a noticeable difference between the two events. David Elder insisted there was no boat in view. If it was truly a bow wave, the boat would have surely have been in view. As you can see on my video, the cruise boat is clearly on the right as I pan over. It's a pity Mr. Elder's video does not pan to the right to prove beyond doubt that no boat was involved. However, if one desires photos that will be more convincing to the general public, the height to width ratio of the object has to be higher. Another realisation dawned upon me and that was the time of the year. I was here about two weeks earlier than usual due to other commitments and the difference in tourist numbers was noticeable. In fact, it was verging on frustrating. Fort Augustus was heaving with people as streets were lined with pedestrians and the roads were well supplied with vehicles. It even proved impossible to find a parking spot in the main car park. Looking over to the Cruise Loch Ness boats run by Marcus Atkinson, the queues were as big as I had ever seen them. So much for the unattractiveness of a wet summer. I decided it would not be a particularly good time to engage him in a long conversation. Going back along the southern side of the loch, I was minded to stop off at one of my favoured spots only to see a motorcyclist standing there by his steed checking his smart phone. With a shrug, I drove on a few hundred yards to another spot I like only to find a car of tourists parked and munching on their lunch! Okay, I didn't quite shunt their car into the loch to free up the space, but I did resolve never to visit the loch again so near to the peak of the tourist season. The camp owners told me the peak occurred just after the beginning of the English school holidays a week or so before. You see, monster hunters are a bit like those bird watchers you see couped up in camouflaged hides waiting for their feathered quarry to appear. They need a bit of quietness and solitude, some tranquillity to focus the mind and the eyes. This particular visit felt like ornithology in Piccadilly Circus! Be that as it may, we need tourists to be part of the story as they form a sizable part of the witness roster, so long may their thronging of the loch continue! I just won't be there to see the worst of it. But then we had the night hunts. The tourists are in their beds or at the bar and I am alone with the loch again. Like others, I am sure Nessie is a nocturnal creature. Bound by nature and circumstances to swim through darkness, it is no surprise that the silent opacity of the midnight surface offers no resistance to the creature. The trouble is the loch, as seen from the shore, is as black as pitch. The problem is resolved with infra red vision equipment. I have a pair of Yukon Night Ranger binoculars which offers a composite video feed to a recording device. In my case, that is a bog standard laptop running video recording software. The Yukon video feed runs through a usb conversion cable and Bob's your Uncle. As an experiment, it was off to the area near Whitefield on the side of the loch opposite Castle Urquhart. The idea was to see how that classic sight would look on infra red. It would also put beyond doubt that any footage was taken at Loch Ness. The results were not that good as it turned out. I include a short clip below. At that time of night, the castle is still bathed in the light from spotlights and on infra-red their intensity made it look as if the castle was up in flames! You can also see how bright a passing car on the A82 appears. This seemed to have a kind of bleaching effect on the rest of the darker areas. The loch surface was too dark and grainy as the software in the equipment compensated for the flood of light. Well, that is the way it seemed to perform. By contrast, the night footage I took from the beach at the Foyers campsite offered the kind of resolution I am looking for. Check out the clip below for a compare and contrast. If you had looked out on the loch at the same time with the naked eye, it would be complete darkness. It's a great piece of equipment to have in the armoury - if you can stay awake! A visit was paid during the day to Steve Feltham. As we approached his now static mobile home, he pulled up in his Volvo after an enjoyable time at the Belladrum Festival. He didn't have any news on sightings at the loch and the conversation inevitably turned towards catfish and the recent controversy over remarks he had made. Steve was unequivocal in saying that his suggestion that Wels Catfish solved the Loch Ness mystery was a misquote. It was just a theory amongst others and didn't explain the long necked sightings. I guess you could take that two ways, but the hunt continues as far as Steve is concerned. The less said about Loch Morar the better! Having decamped from Loch Ness, we diverted west onto the Mallaig road and arrived at Loch Morar about two hours later (nice having two famous monster lakes so close to each other). It is quite a winding little road that gets you to the secluded village of Bracara on the north side. I remember reading Tim Dinsdale on how he went to the loch in his old Mercedes towing his Water Horse boat. That must have been a hairy drive! Unfortunately, the trail camera I had left was gone. Stolen, I'll wager by someone who has no respect for other people's property. Such is the risks of monster hunting but lessons have been learnt at this place where two cameras have now gone AWOL. And so ended another trip to the cryptid lakes of Scotland. I will let things lie now for the colder months and hope to be back in the Spring of 2016.